What are the admission requirements for this course? There are no admission requirements. Programs offered through PACE are non-credit open-enrollment courses. Do I have to be online at a specific time for class, lectures, etc.? You do not have to be online at any specific day or time. There will be assignments with due dates set by the instructor to be completed each week. These can be in the form of video lectures, reading assignments, discussion board participation, quizzes, etc. When will I receive information about my course? For online courses, you will receive an email on the first day of the course letting you know the course is available and how you can access it. For on-site courses, you can expect information one to two weeks prior to the first day of the course. Are there books or other materials required for this course? If there are any required materials, they should be listed on the individual course website. (This information will not appear on the the certificate or series page.) Students are responsible for purchasing any required books or materials. Changes to the textbook requirements will be emailed to students. Please check the webpage to ensure you have the most up-to-date information. We cannot accept registrations by phone. The PACE registration system uses existing email addresses and their corresponding passwords as a unique identifier on student accounts. For this reason, we cannot accept registrations by phone as it would require PACE staff acquiring the students’ email address and password. Most government funding sources do not approve non-credit courses, and at this time we are unable to accept Post 911 GI Bill funds, FAFSA or other government aid. We do accept AmeriCorps funding for approved courses. Please see our Student Resources page for options. Select the Register Now button on the website of the course that you would like to enroll in. To enroll in a course that is part of a certificate or series, click the Register Now button on the individual course page. If you have already registered and completed a previous course, the program may remember your login information. If you do not remember your login information, please contact us at PACE@oregonstate.edu or 541-737-4197 so that we may help with your registration. Select More Options if you do not see your desired login credential. You will then see the window below with additional options. Choose one of the providers listed and enter your email address for that provider and the password associated with it. (We suggest you do not used LinkedIn as there have been some problems with it. 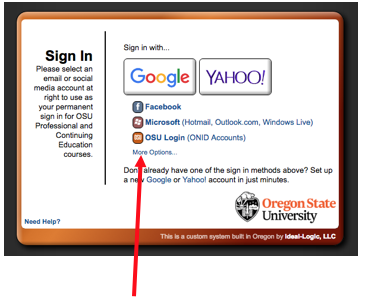 Also, the OSU login is for Oregon State University employees only). NOTE: Once you are logged into the system, bookmark this page as this is how you will access your account going forward. IMPORTANT: You will always use the same login method as well as the same email and password, so be sure to keep careful track of this information. Confirm that your course has been selected, and then click the Next button. After your registration has been submitted, you will receive a confirmation email. Once the online course starts, you will receive another email letting you know that your course will be available within 15-30 minutes with a link to access it. What if I don’t have an email account for one of the providers listed? In an effort to safeguard your information, Oregon State University PACE uses a provider-based login system. This means that when you use a Google, Yahoo, etc. email address as your login, the password is stored with the provider. We do not have access to your password and your information is more secure. Due to this, the only way to access your course is by using one of the providers on the list. If you do not have an email address with a listed provider, you can sign up for a free email account with Gmail or Yahoo. We suggest you do not used LinkedIn, as there have been some technical issues with this platform. The OSU login is for Oregon State University employees only. 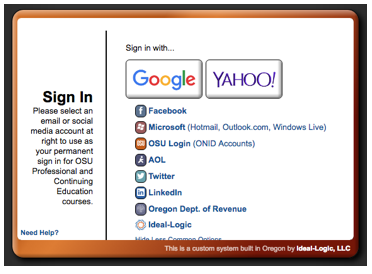 In an effort to safeguard your information, Oregon State University PACE uses a provider-based login system. This means that when you use a Google, Yahoo, etc. email address as your login, the password is stored with the provider. We do not have access to your password and cannot help you change it. To change your password, please click the “Forgot Password” on the provider’s login site (i.e. Google, Yahoo, etc.) and follow their instructions. Someone else’s information shows up (auto-fills) when I try to log in and I can’t enter my information. If another person is also using your computer and has logged into our system, the information may be cached. To remove their information and log in, you may clear the cache on your device (if you’re unsure how to do this, google “clear cache” with the name of your browser). You may also open a private or incognito window and paste the link https://apps.ideal-logic.com/osupace into the web address bar. To open a private or incognito window, you can press the following keys depending on your browser. I know I registered, but I can’t see my course when I’m logged in to my account. This generally happens when you’ve inadvertently created two separate accounts. Contact us at pace@oregonstate.edu or 541-737-4197 for assistance. If you have two accounts, we can merge them into one. The email address I originally used to log in is no longer valid. How do I access my account? You will need to create a new account with a current email address. On the second screen of the new account setup, you’ll be prompted to enter any other email addresses you may have previously used. The system will update your account with the new information. If this method is not successful, contact us after you create your new account and we can merge your accounts into one. I want to use the Canvas app to access my course, but it doesn’t work correctly. If prompted by Canvas to download and use the app for our courses, do not do so. Our courses will not work on the Canvas app. To access your course, you must log in to your account at https://apps.ideal-logic.com/osupace and click the Access Course button. We have also received reports of issues with iPads and other tablets. My course starts Monday, but I can’t get in. Access to a course is granted on the first day of the course, usually before noon. You will receive an email letting you know that the course is available along with instructions on how to access it. If I take courses individually instead of purchasing the entire series, will I still get a certificate? Yes. Our system tracks your course progress and will grant you a certificate once all required courses are successfully completed. However, you usually will save money in registration fees by registering for the entire certificate at once. How do I find my grade? Once grades have been released (you will receive an email notification), you may log in at https://apps.ideal-logic.com/osupace and click the "Grades" tab on your account page. Note: Grades may take two to four weeks to be posted. Once grades have been released (you will receive an email notification), you may log in at https://apps.ideal-logic.com/osupace and click the green "Print Certificate" button in the Courses section. How do I obtain my digital badge? Once you have completed all courses required to earn a digital badge, you will be notified by PACE that your badge has been awarded. You will also receive an email from Basno with instructions for claiming your badge. How do I receive a transcript of the courses I’ve taken at PACE? Since PACE offers non-credit courses, official transcripts are not available. We do offer a Student Enrollment Record, which will show the courses completed, the completion dates, the grades assigned and the number of CEU or PDU credits awarded, if applicable. To see this record, log in at https://apps.ideal-logic.com/osupace and click the "Grades" tab on your account page. In the upper right corner of the "Grades" tab, you will see a green "Print Student Enrollment Record" button. Can I transfer to a later session if I am unable to complete my course? As soon as you know you will be unable to complete the course, and prior to the end of the course, contact us at pace@oregonstate.edu and send us a request in writing to transfer to a later session. Note: There is a $60 Transfer Fee due when you register for the future session. This feature may be used only once per course. If a second transfer is needed, the student must pay full price for the course. Email us at pace@oregonstate.edu and request that we cancel your course. Email us at pace@oregonstate.edu and request a refund. Please review our Refund Policy to ensure you are eligible for a refund. The credit card used to pay for my course has been cancelled. How do I receive a refund? PACE may refund only in the manner in which we received payment. This means that we must refund to the same credit card on which we originally processed the payment. If your card has been cancelled, you will need to contact the bank that provided the card and discuss how to receive the funds once we have processed the refund. If you have a question or issue not addressed here, please contact us at pace@oregonstate.edu or by phone at 541-737-4197. Be sure to give full and complete details of the issue you are inquiring about.